YES!!! 110% Yes! We know how crowded the homepage and site in general is on a mobile device, which makes it extremely hard to navigate. We are currently in the process of creating a better way to display it so you can get around easier andddd we are pushing for all our new content to be mobile friendly! The customization and pet views will be a bit longer but special events on the site (including Advent Calendar) will be viewable from mobile! Sure! So we understand the issue here, however, we want to make sure when we bring this game back it is working well for everyone and doesn't have some of those issues we saw in the past! So, we are working to fix some of those issues and get you all catching those ghouls again as fast as possible!! Wow, that would be depressing to get rid of them! All these games definitely have senitmental value to a lot of Neopians and we would never want to lose them! We are definitely considering the options but no fear, the games won't be going anywhere! It's more of a question of "whats the best course of action" rather than "should we keep them or not." So I wouldn't worry at all! In fact, we are planning on releasing the first set of mobile-friendly (aka not flash) version of our games in the upcoming months! Hi Scrappy! Thank you soooooo much for revitalizing the site, especially the NC Mall! Love all the new stuff and new ideas. I was wondering, could you create a bigger gift box that could hold 5 items? Or maybe even 10!? This would facilitate trading for higher value items while cutting down the box count necessary. Thank you! Hm, that's an interesting idea but I would definitely have to make them extremely rare, if we were to do this at all. Am I allowed to use my 5th pet slot on side accounts? I believe this may have been answered before (so don't get annoyed I'm answering it again) but it's fairly important so yes, yes you can. Every account (main or side) can have 5 lovely pets now!! ABSOLUTELY NOT! We are hoping to get rid of the lookup pages in the next couple of weeks and move forward from there! But yeah, definitely not permanent....definitely not. Hi Scrappy I've been playing Neopets for over 17 years and I Know TNT is about to have it's 18th birthday. 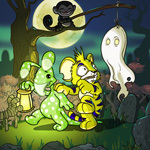 Now that I'm older I can pay for NC and premium, I'm just wondering what is the best way to show my site appreciation and support to keep neopets running for another 18 years? You might be asking yourself, what makes the Brain Tree have a beautiful mind? Sure he may have a smart mind, but is it truly beautiful? After reading this article, I think you’ll agree that the brilliant tree’s mind is so much more than brilliant. WAIT, I DID WHAT EXACTLY?